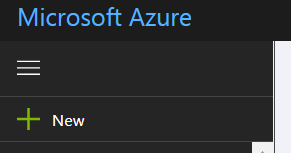 So here the question is do you have an Azure Tenant already ? if not you need to sign up for one and enter card details but for OMS im using the free plan but you still need payment details i believe. 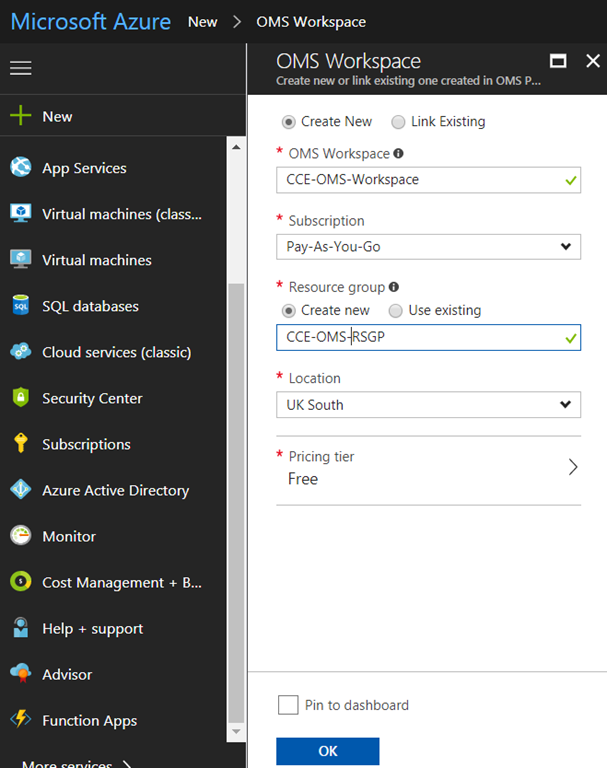 I had an existing tenant although as i started to add an OMS workspace it had expired so i had to add a pay as you go subscription but there are free trails out there to be had. A workspace is an Azure resource and is a container where data is collected, aggregated, analyzed, and presented in the Azure portal. I selected create new and entered a workspace name, selected the subscription i was using so yours may be different, i created a new resource group and selected location. Pricing i was staying on the free pricing tier but there are paid options. Clicked ok and it went off to create. 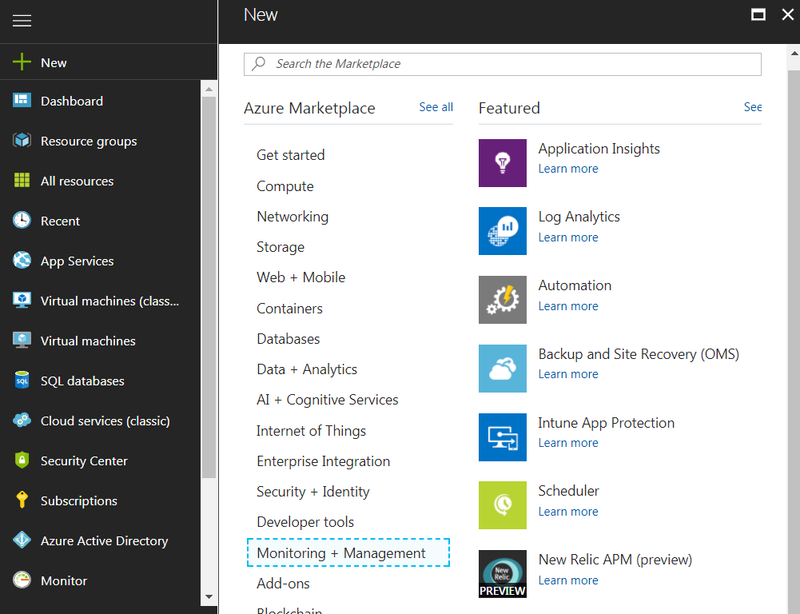 Know i went to all resources from azure portal left hand side menu and found my Workspace and clicked on it. 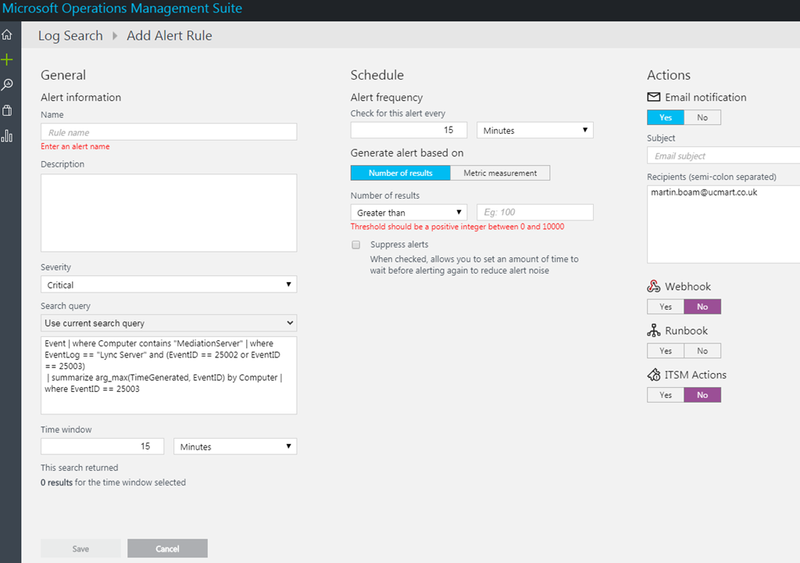 You’ll need to configure your Cloud Connector on-premises environment to use OMS. *** Please note i found without connecting a source you could not create alerts to workaround this for this blog i added my surface pro. I download the Windows agents, installed and entered the workspace id and primary key. This part i haven’t done yet as im waiting for access to the CCE in our lab. Update should follow very soon but the steps from TechNet are here for the moment. In the CloudConnector.ini file [Common] section, set the OMSEnabled parameter to True. 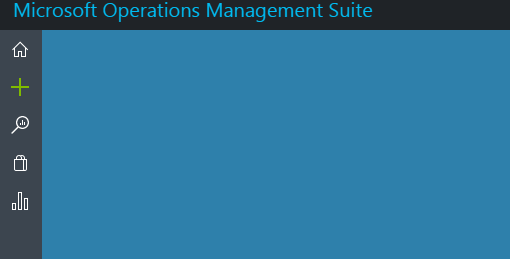 Each time Cloud Connector is deployed or upgraded, it will try to install the OMS agent automatically onto the VMs. 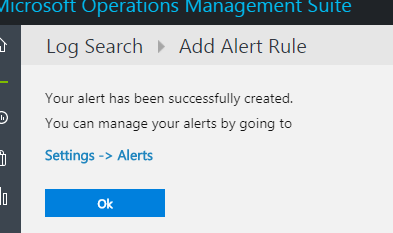 Enable this feature so the OMS agent can survive the Cloud Connector automatic update. To configure the OMS ID and key, run Set-CcCredential -AccountType OMSWorkspace. In the CloudConnector.ini file [Common] section, set OMSEnabled=true. We accepted the message to redeployed after we ran the cmdlet. This was on an AudioCodes CCE appliance. I was asked to enter the OMS workspace ID first. After i grabbed the ID and Key i first entered the ID and thenm the Key when prompted. We ran the cmdlet and then was asked to Enter the OMS Workspace Key as shown above and then reconfirm. And thats our existing CCE configured and OMS Agents deployed. 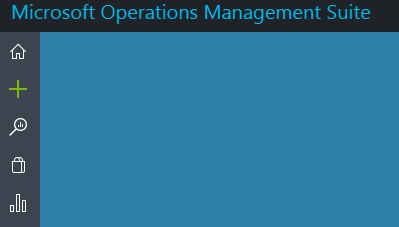 Lets go check the OMS portal and see if the CCE VMs and Host are connected. To apply the updates, run Install-CcOMSAgent. 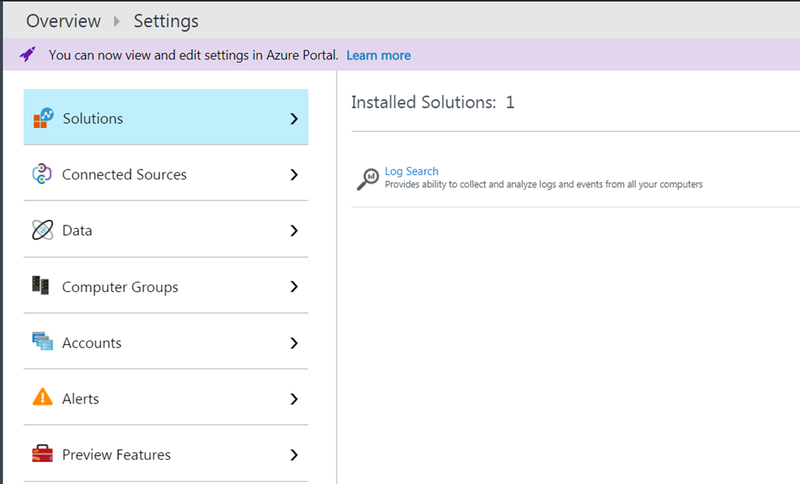 In the OMS portal, go to Settings -> Connected Sources -> Windows Servers. You will see a list of connected machines. 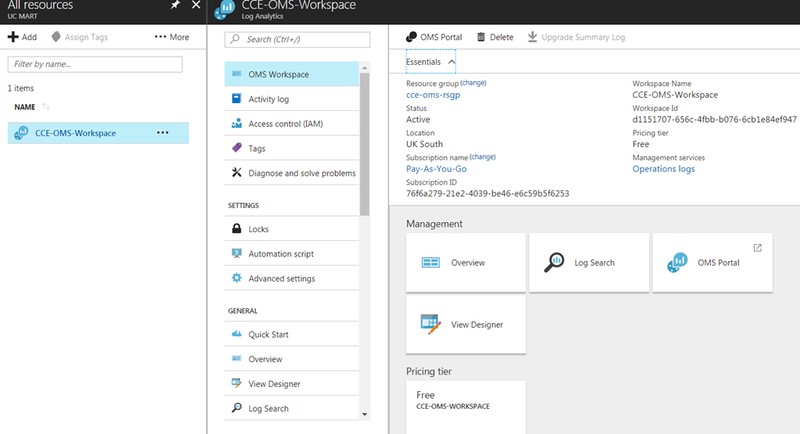 Now OMS workspace is created and CCE is pointing to our workspace its time to configure OMS. You must manually enter Lync Server in the text box. It does not appear as an option in the drop-down list. Here i clicked the “Add the selected performance counters before adding the new ones. 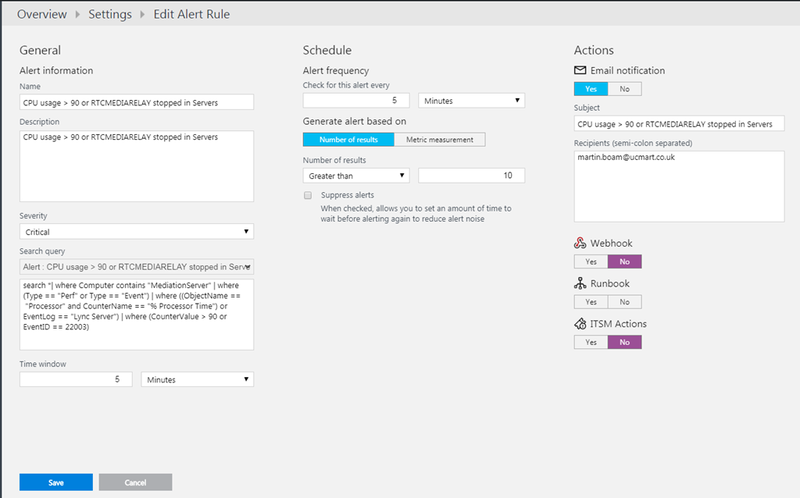 I then had to save configuration to move to create alerts. Make sure the alert is a Number-of-results alert, which is the default selection. The demo queries require that “Number of results” is set to “Greater than 0”. It is recommended that you set both Time window and Alert frequency to 5 minutes. It is recommended that you do not enable “Suppress alerts” for demo alerts. 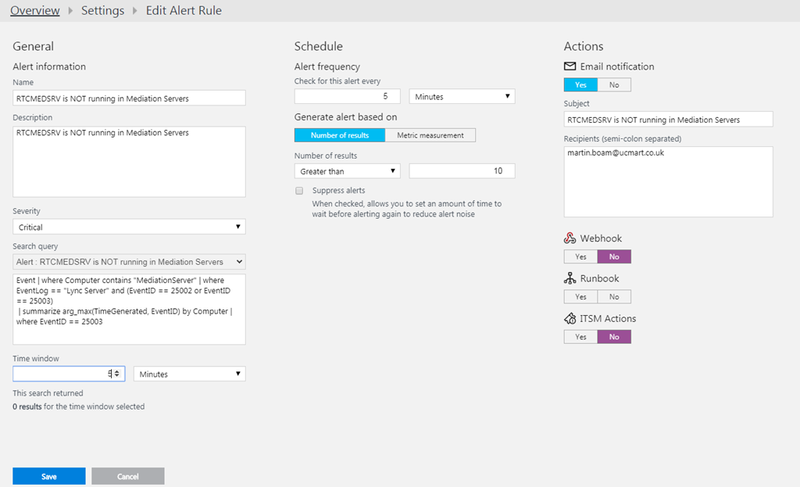 For typical alert scenarios, Microsoft recommends creating a pair of alerts: one error alert and one reset alert. For the error alert, select severity level Critical; for the reset alert, select severity level Informational . 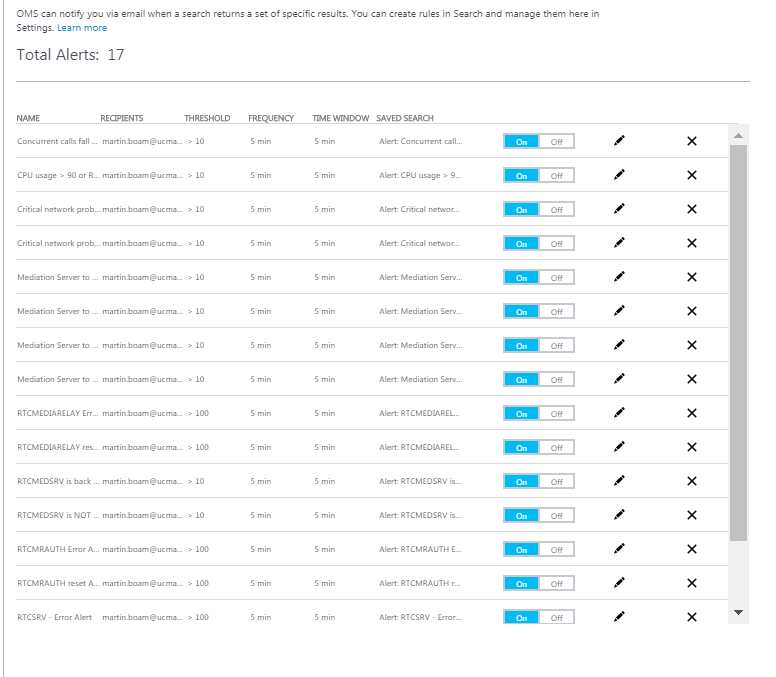 For Alerts they look to be pairs so you have a alert for error state and a alert for reset back to normal which makes sense so you know when its broke and when its back to normal. 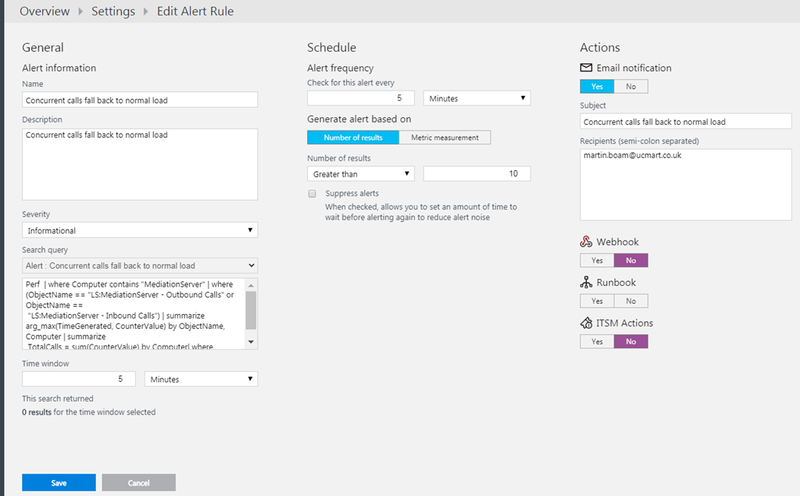 I found this Azure documentation on alerts which was useful to read for creating alerts as its not mega easy to start with. I tried under Settings below but couldn’t see how to create, i think they are listed here only once created. You can create rules in Search and manage them here in Settings. 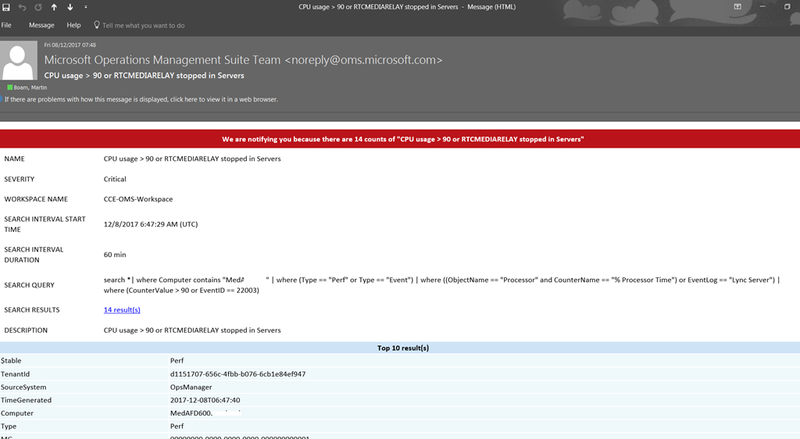 Here i copied the sample CCE alerts from Technet link but perhaps noted also an error in one. please read below. 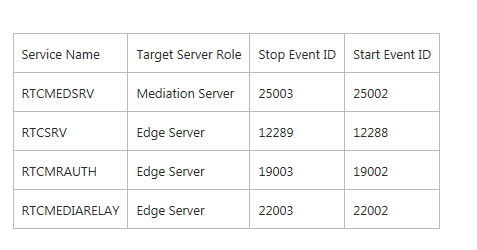 You need to update the server name though as mentioned in technet link this looks for server which contain name mediationserver. 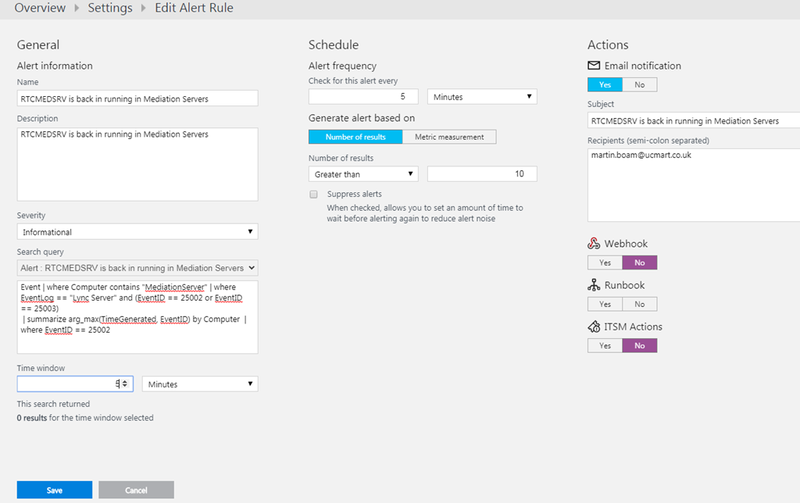 Create an alert pair: "RTCMEDSRV is NOT running in Mediation Servers" and "RTCMEDSRV is back in running in Mediation Servers"
Next created the other alert in the pair this time it was the reset alert so i set severity to informational. On Technet there is an Error as the reset is missing the 2 on the end. 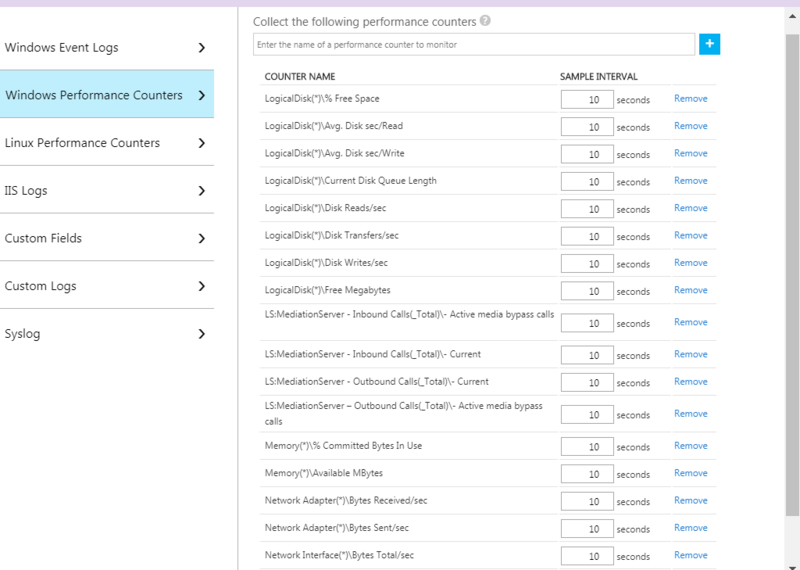 The query will get all processor usage counter and service stop event from all computers and return one log if either processor usage exceeds 90% or service is ever stopped. Recommended minimal monitoring set from Microsoft. So looks like we need to work this out on our own so ill give it go. I dont if these are correct but perhaps it will help someone. Please these were added in the examples before from Technet but i think Technet has missed the 2 off the end of the start event ID. The following lists the call capacity counters that should be monitored. These numbers should be less that 500 for Cloud Connector standard edition; less than 50 for Cloud Connector minimum edition. 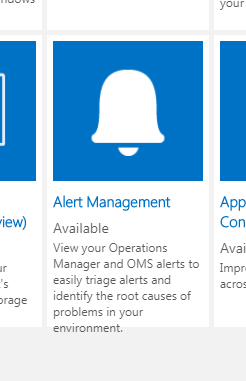 A section i skipped over but will look at now is analysing the log rep.
Reading this it looks like i should add Alert Management solution to my OMS workspace. 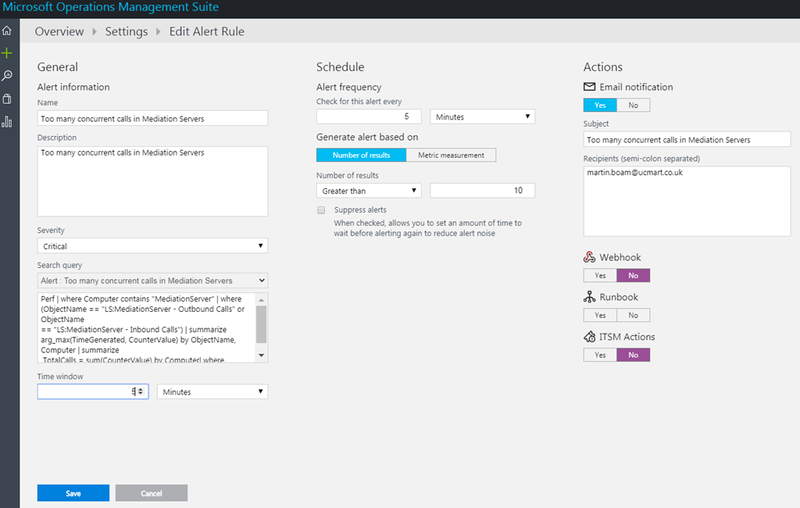 Whats Alert Management ? 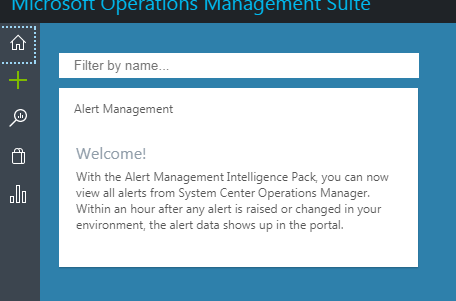 When you add the Alert Management solution to your OMS workspace, the Alert Management tile is added to your OMS dashboard. This tile displays a count and graphical representation of the number of currently active alerts that were generated within the last 24 hours. You cannot change this time range. Seems quite a bit of work but once its all set up i can see the power of OMS and alerting for CCE will be awesome. I just need to hook up a CCE to my OMS workspace and get testing this now which i hope to do very soon so ill update. 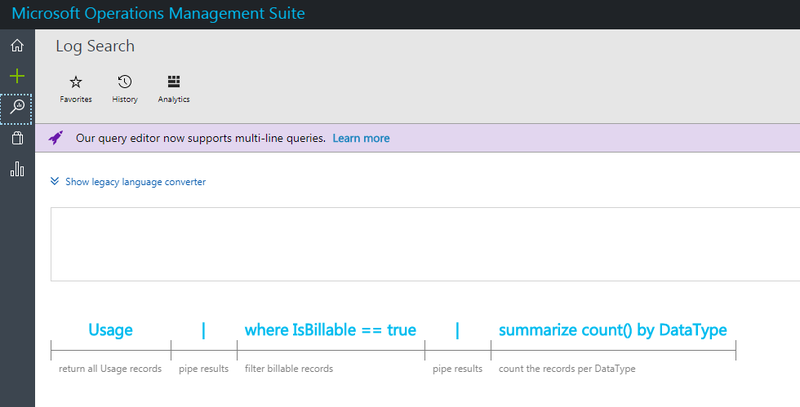 Cant wait to play around more with OMS and use it for more than just CCE monitoring and management ! Hopefully this will be useful to someone setting it up. After playing around with the Alerts and thresholds i found at first i wasnt getting any alerts so i had to tweak the settings i had first used as getting 5 errors in 5 minutes didnt seem like it would ever hit a alert. I had to set the Number of results” is set to “Greater than 0” to get alerts to work. Here’s an example an email alert from the Alerts i had setup. As i continue to play more i will update this post.